"We love our pool and so happy that we got to enjoy it so often this summer. We were also happy with the professional and work of the trades people who we used based on the Kemptville Pools list. In Ottawa and Kemptville, we are renowned for designing pools that exceed our clients’ expectations. 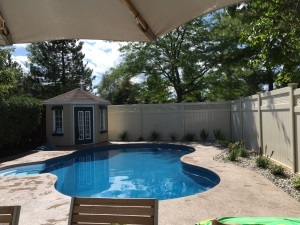 As we never owned a pool before this summer, we asked lots of questions from many other pool owners and the clear advice we received was to go with Kemptville Pools - sure enough it was way easier and simpler than I could have ever imagined. The staff made the whole process so easy, starting from helping us choose the right shape, colour, size and positioning of the pool and taking us through the step by step process of installation. Kemptville pools gave us the full service we were looking for and a high quality product to enjoy for many years to come. It was an absolute pleasure dealing with all the people involved in installing and finishing our beautiful pool. We are heading into the third season of enjoying our Kemptville Pool. We have a pool and lounge area that is perfect for our home, our family and our lifestyle. From the beginning of the design phase to the moment the water went in we were impressed with the service and the product. We have recommended Kemptville Pools to anyone we hear is thinking of getting a pool. They will not disappoint and you will have a pool that you and your family will enjoy for years to come! service, you are top notch!!! Thanks you to the whole team, and that includes the office staff, who are always so pleasant on the phone. Thank you so much. Your guys were fantastic, both my husband and I were immensely impressed at their efficiency, organization and productivity. They were pleasant, professional and when finished the did a great job cleaning up after themselves. It's no wonder Kemptville Pools has the reputation that it has. Just wanted you to know how happy we are with the efficiency and productivity of the project. I tell anyone and everyone to get a Kemptville Pool pool. Customer service can’t be beat!!! I just wanted to drop you a note regarding the site crew we have. I wanted to let you guys know how very impressed we are. These are very hard working, very polite guys one and all. They are positive and respectful in the extreme. Basically I can't say enough good things abut them. I also hold your site manage run very high regard - again, a very professional young man. We really appreciate your help and hard work - you guys actually make a construction project exciting and pleasant. Just wanted to reinforce how pleased we are with this experience. We met with Ashley and Dave yesterday for the electrical hookup. Like everyone we have met from Kemptville pools and your network of trades we were very impressed with the work and with the professionalism. Ashley did a great job, left the worksite in pristine condition - even swept up the floor where he was working indoors. People such as Ashley, Andrew, Chris and other members of your trades team as well as Joel,and the rest of the install crew reflect a profound professionalism and pride in what they do; this is what Kemptville Pools brings to its customers. You make us feel like family. We can't thank you enough and would be happy to share our experience with potential customers. I can't believe how awesome the customer service is at Kemptville Pool and Spa. I called to complain about my aquarit chlorine generator not working this morning and within 3 hours of the call, it was fixed! James was over about an hour later to replace the board and all was well. I have and will continue to recommend Kemptville. With customer service like that, how could you not. We would like to send you our thanks for the great work that you accomplished. The work was started on time, finished on time and proceeded without any unpleasant surprises along the way. You kept us informed through the process and we always knew what was coming next. We are very pleased with the result. The design is stunning and we are totally satisfied with the quality of the workmanship. We have had a great month of August in our new pool and are thoroughly enjoying it. We would like to thank you again for the great work!! I have to tell you how impressed I have been with the after service that we have received since you installed our pool four years ago. We are as happy today with it as we were when it was new. Ed you gave us some great ideas and I am happy to say that we took many of your ideas and implemented them into the final product. I would recommend you guys hands down for anyone who is thinking of a pool. We were very impressed with the service, professionalism and quality of the entire team. They walked us through the entire process, answered our questions and made it easy. Kemptville Pools was fantastic. Why would you go anywhere else. Thanks Ed and Fred and the entire K-Team. We Love our pool!!! We would like to say...WE LOVE OUR POOL! AWESOME JOB! First wanted to convey how much we love our pool, the kids are little fish and it’s been an instant boost to our social network! We especially appreciated the team/family approach to your installation. Any concerns or questions we have along the way, are discussed in a timely manner. Everyone loves the pool!! You guys did a great job, I would definitely recommend. 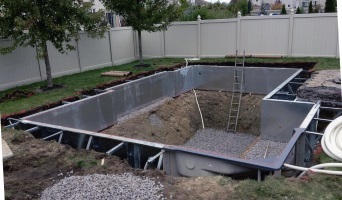 You can trust the leading pool installer in the Ottawa Valley to build you a quality in-ground swimming pool at a great value.